I’ve been truly blessed to grow up in tight knit family. 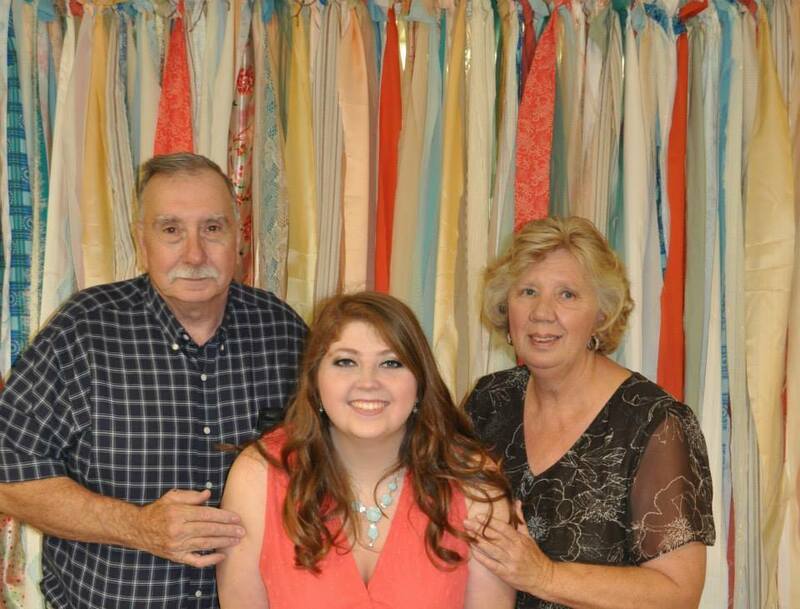 As long as I’ve lived, I’ve always had a close relationship with my grandparents. I genuinely believe they are some of the best people to ever grace this Earth. 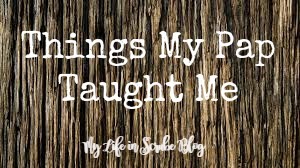 I’ve learned a lot from my Pap over the years, but I wanted to share some of my favorite lessons. 1- Generous Tipping. My pap knows a hard worker when he sees one. He recognizes individuals who work tirelessly to better their situations. I love going out to eat with my Pap because of the respect he shows to the staff. He tips generously, with a glad heart. Rather than leave the cash on the table, my Pap takes the extra effort to shake the hand of the employee and thank them for a job well done. A true gentleman. 2- How to speak to The Lord. Since I was a little girl, I have always modeled my own prayer after how my Pap prays. I’ve watched him respectfully remove his hat before bowing his head to talk to God. I’ve heard my Pap speak to Jesus as often as I’ve heard him speak to his friends. Pap is always thankful, and in every prayer asks the Father for forgiveness where we’ve failed Him, because we fail Him daily. I find myself often praying in the same way. 3- Never be without a Bible. My Pap worked in the deep mines for the greatest part of my childhood. He recently told me about how he always carried a New Testament Bible into the mines with him. Imagine what a testimony that would carry. Pap was always prepared if a man decided to follow Jesus while deep in the ground. At our Pinning Ceremony, each graduate received a small New Testament Bible, donated by The Gideons. My Pap encouraged me to include it with my other supplies and ensure it goes with me as I care for patients. 4- To speak kind words. I have never in my life heard my Pap speak an ill word toward anyone. I’ve never heard him judge another person as long as I’ve lived. Through his example, I’ve been shown the importance of kindness. My pap is a goodhearted man, but he is also as stubborn as the day is long. 5- How to deal with disappointment. As a preschooler, my Pap took me to breakfast at Hardees every single day without fail. And every single day, I ordered French Toast Sticks. Until one day, the lady behind the counter tells me they no longer sell French Toast Sticks. My heart broke that day. I just know my eyes welled up with tears. But my Pap encouraged me to see this disappointment as an opportunity to try something new. “Try something else instead.”, he said. And I did. What lessons are cherished in your family? How do these lessons apply to your life? Congratulations on your acceptance to a nursing program! And welcome to the next chapter of your life. A chapter filled with blood, sweat, and tears; and textbooks, scrubs, late nights, and laughter. Welcome to the beginning of your story. 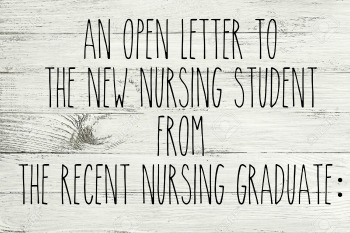 As a recent nursing graduate, I would like to shed a little light on your next couple of years. Something I wish someone had done for me. The men and women who you meet in nursing school will change your life. Let them. You will be tempted to look at them as your competition, don’t. Instead of seeing your classmates as enemies, see them as your comrades in arms. Treat them as your brothers and sisters. Love them, laugh with them, learn with them. You might just make a friend or two along the way. Trust me, there are enough A’s to go around for everyone and there will be enough other stuff to become bitter towards. Don’t waste your time and energy competing with one another. Classes that are close to one another are typically more successful. Prepare for battle. Arm yourself with post it notes, highlighters, and your favorite pens. Bring your God given intelligence to class every single day and then work even harder. And seriously, show up to class every single day. Think about the day you’re caring for real patients and you’ll be wishing you hadn’t skipped the lecture on fluid volume overload. There will be days you will write notes until your head spins, and your eyes cross, and your hand cramps. On those days, grip your pen a little tighter and keep fighting. Friend, I don’t know you’re going through at this moment, or what challenges you’ll face as you endure your nursing program, but the Good Lord knows. I’m telling you, there must be something about nursing school that causes everything else in your life to go haywire. But He knows your struggle, lean on Him and He will get you through to the end. Trust me, I’m living proof of that. When you’re scared, pray. When you’re stressed, pray. When your heart breaks for the patient you are assigned on day one of clinical, pray. And don’t stop. Befriend your teachers. No one wants you to pass more than they do. Except maybe your mom. Don’t be afraid to ask them questions. You’ll feel more stupid not knowing than getting the information you need. Accept that they don’t actually know everything, no one does. And one amazing thing about nursing is that it is a field with a hundred different specialities and the fiend is constantly changing. Treat them like people and they will treat you like people. Once my teacher walked in on my lunch time rapping performance and it was totally fine and hilarious. 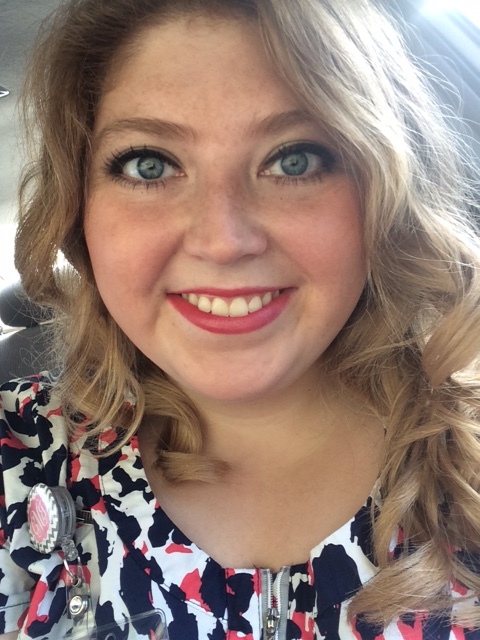 Nursing school is a constant battle, a huge challenge that often seems impossible. But I’m here on the other side to tell you it is possible. 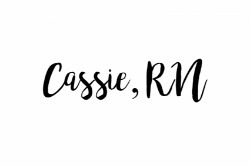 My classmates and I survived nursing school while working, moving, recovering from burn injuries, family emergencies, switching jobs, heart conditions, deaths in the family, raising children, and so much more. It can be done. And when you think you can’t, dig in your heels and find the “thing” deep inside of you that inspires you most. And don’t let it slip through your fingers. Friend, you are capable of being successful in your nursing program. Trust me when I say the years that are approaching will be some of the most unforgettable, challenging, and rewarding years of your life. There will be days you wake up and cry because you have a test in a couple hours. There will be days your stomach aches from laughing so hard because your classmates are hilarious. There will be days you wonder how you’ve made it on such little sleep. There will be days when you know your blood pressure is through the roof because you’re so stressed. And then there will be the day you are pinned as a nurse and the battle was so, so, so worth it. And maybe one day, there will be a day when you and I will work on the same floor and together we will hold the hands of our patients in their hardest days. Until then, best of luck on your educational journey.